What Hi-Fi? Awards 2016 - all the winners revealed! | What Hi-Fi? What Hi-Fi? Awards 2016 - all the winners revealed! The What Hi-Fi? Awards 2016 winners have now been revealed! There are 102 individual winners across 27 categories, showcasing the best hi-fi, home cinema and portable audio products on the market. 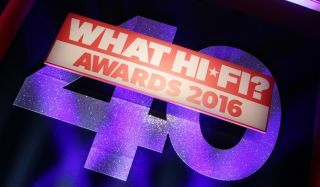 You can see the full list of winners live now on the What Hi-Fi? Awards 2016 microsite. 2016 is the year that 4K Ultra HD TV has really taken off, with all but one of our seven TV winners offering 4K capability. Samsung won TV Product of the Year for its superb UE49KS8000 4K model. At the top of the TV market, LG scores a double with wins for two of its breathtaking flagship 4K OLED screens, the C6 and E6. Of course a 4K TV needs plenty of 4K material to feed it, and for that reason Netflix - which has championed acclaimed series such as House of Cards and Breaking Bad in Ultra High Definition - is our streaming service Product of the Year. Panasonic picks up a Product of the Year for its excellent DMP-UB900 4K Blu-ray player, and the new Sky Q service is our set-top box Product of the Year. But there’s some classic vintage tech too. Who would have thought that four decades after What Hi-Fi? was founded in 1976, vinyl would still be going strong? While other, newer formats have come and gone, the good old record is thriving and turntable sales remain strong. This year there are four turntable Best Buys, including an Audio-Technica USB deck that enables you to digitise your records. The Awards are revealed as What Hi-Fi? celebrates its 40th anniversary, capping four decades of offering simple advice on the best home entertainment kit to buy. Head over to the What Hi-Fi? Awards 2016 website to see all the winners.